A large brimming garden is a standard feature of Amish homes. 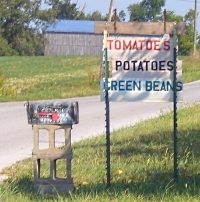 Amish eat a lot of home-grown vegetables, including tomatoes, eggplants, spinach, and beets. Some of the garden crop gets canned for the winter (see Amish Canning Recipes). Much is cooked and served up in a wide range of hearty dishes. Try some of these classic Amish and Pennsylvania Dutch-style vegetable recipes at your next family meal. Share your Amish Vegetable Recipes here. Wash the spinach thoroughly. Drain and cook in a covered pot (with a little water) for 8-10 min on moderate heat. Drain and chop the spinach. Add milk, the eggs, 1½ cups of the bread crumbs, melted butter, pepper and salt. Mix well. Sprinkle the bacon and leftover ½ cup of bread crumbs on top. Bake for 35 min at 350 degrees F.
Pare the egg plant. Cut in slices of ½ inch thickness. Soak eggplant slices in salt water for about 60 minutes. Drain eggplant and wipe slices dry. Dip the slices in beaten egg then roll in cracker crumbs or fine bread. Fry in hot fat (or deep fat) until well-browned on both sides. Goes well with tomato sauce or ketchup. Set a layer of tomatoes into a casserole dish or greased baking dish. Add half the sliced cucumber and onion, and half of the crumbs. Add more layers using the remaining tomatoes and the cucumbers, crumbs and onions. Top with tomatoes and sprinkle with cheese. Bake for 40 min at 375 degrees F.
Cut large, solid, ripe tomatoes into slices of ½ inch thickness. Dredge thickly with flour. Fry tomato slices quickly in 2 tablespoons of hot butter. Be sure to browning both sides thoroughly. Remove tomatoes and place on a serving dish. Sprinkle with salt, pepper and brown sugar to taste. Keep tomatoes warm. Add 1 tablespoon of butter to the pan fryings and then blend in a tablespoon of flour. Add the milk and cook the mixture, stirring continuously. The resulting mixture should reach the consistency of thick cream. Pour this over the tomatoes and it is ready to serve. Slice up celery and then cook in a little salted water, until tender and almost dry. Create a dressing using egg, flour, sugar, vinegar and water. Bring to a boil and add the sour cream when it thickens. Pour this dressing over the celery. Heat and serve. Cut off beet tops while leaving 2 inches worth of the stems. Clean beets well, then place in pot and cover with boiling water. Cook beets until soft. Slide off the outer beet skins and dice. Strain and save 1 cup of the water in which the beets were cooked. Add butter, sugar, vinegar. Thicken with 1 tablespoon of corn starch and then cook to the thickness of cream. Add in the diced beets, pepper and salt, and heat. Boil the parsnips in salted water. When they become tender, peel and remove the core. Mash the parsnips. Add in the shortening, bread crumbs, salt, pepper, sugar, plus 1 egg (and the beaten white of the second egg). Mix well and shape into cakes. Add a small amount of milk to the remaining egg yolk and beat. Dip the parsnip cakes into the egg, roll in bread crumbs or corn meal. Fry to a nice brown color. Share your Amish Vegetable Recipes in the Comment Box below! Please type recipe title (ie, “Amish Broccoli Casserole”) in the “Comment Title” box.